You can use this distance calculator to find out the distance between two or more points anywhere on the earth. In other words, the distance between A and B. Click once on the map to place the first marker and then click again to position the second marker. The distance between the points will then be displayed. You can also build up a series of locations to find a total distance. An important feature of this distance calculator tool is that it is "as the crow flies", so traveling in real life will normally involve larger distances, but this may also help those who need to measure off-road distances. 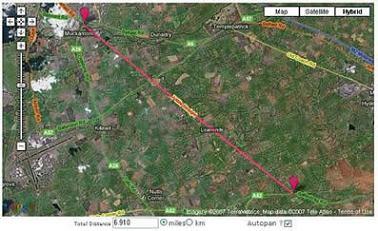 To share your route and distance calculation use the option [Generate Link For This Route]. You can then copy the link generated and send this via Twitter or Facebook. You can move the markers after they have been positioned so you can modify you route on the fly and see how the distance will be affected. The map will also automatically save your route in your temporary internet cookies so that you can return and see the route as you last left it. If you ever need to start from scratch then use the [Clear Map] button. Map showing the Mary Peters Track in South Belfast. 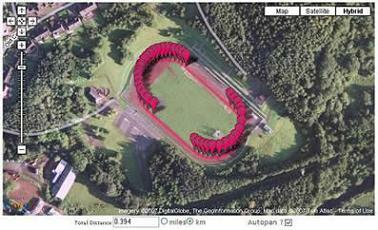 The reading shows 0.394km which is clearly a reasonable measurement for an athletics track. Map showing the estimated distance between New York and Paris. All references that can be found suggest that this is an accurate measurement. Map showing the Seven Mile Straight in County Antrim, Northern Ireland. This shows a reading of 6.910 miles. 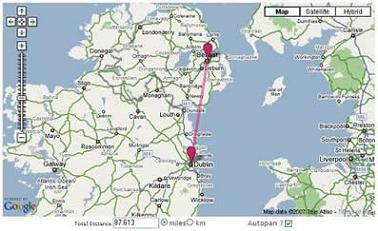 Map showing the distance between Belfast and Dublin. As far as I can see this is an accurate estimate (if there is such a thing). 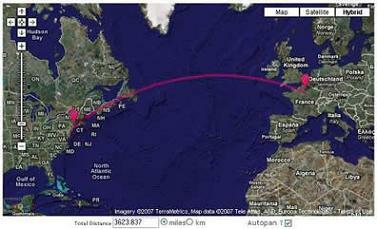 This trip would be approximately 100 miles by road so the proverbial crow would have less distance to travel. 4.7 06/10/2009 Brought Back Quick Find! Google Search bar at bottom left is not yet available. sorry! Uses new cookie so any previous systems/settings on your machine will be erased! sorry! Please report any issues or bugs! Thank you for this great free tool, I've used it every time I map out a new kayak or canoe route. Hi Denzil, there are quite a lot of users using this free resource as normal. It seems the issue you have is specific to your setup in some way. Can you try a different web browser or a different machine to see if it works there? it sure is a shame to see such an excellent site go down so fast for whatever reason. there must be a lot of disappointed users out there that feel the same way as I do. whatever happened to this site which I have used for many years. now all I get is a blank screen when I call up the map. it is so sad to have the functionality of this site. denzil, you need to click the [Load The Map] button] to start using it. Can you confirm you click the button first? I have used this site for years without any problems. However, of late the map does not show up on the screen so the whole program has become redundant, as far as I am concerned. Is there anyway you could resolve this for me. Thanks and I look forward for a solution. The following Zip code is showing somewhere in the middle of the Atlantic Ocean however, it is a Zip Code for White Rock, NM. 87547. I've been using this site for many years and love it. So simple and easy to use! Hello! Do you take requests? I would love it if you would set it to remember the auto-pan setting. I'd like to go a step further, and suggest that auto-pan should default to off??!! Personally I find that a) it is disorienting to have the map move on me, and b) once place a marker, it's basically a guarantee that that location is the one location on earth that you are not going to want to be in the middle of your view anymore! I use this for getting distances for new holes on disc golf courses we take care of. It's surprisingly accurate. Thanks! Fantastic site for plotting runs/distances for routes. Always use it, and the lack of address searching hasn't stopped this being one of most helpful free tools out there! Oh man! Without elevation and the ability to see the location along the map as you move the cursor over the elevation points, the app has regressed to a fairly standard distance calc. I don't understand how an app feature running on a webserver that takes couple of seconds to run increases the cost. Are we talking a bandwidth limit being reached or the webserver max-ing out? I was proud to have contributed suggestions towards the distance calc that the web dev actually found useful in adding. What a shame it's had to be stripped down. What is the plan for the future? Could/Will any of the disabled features be re-anabled? Tony. Wow, this nuckle head is defending this free service! Wow, this is pointless now that it does not pinpoint the address. There are many other distance calculator sites, and many other versions of me. Yet every single time I choose daftlogic's project? This isn't fate, this is true love. KEEP IT UP! Well, this app is useless if its not pointing to the exact location by entering an address! I zoomed to fit and now I have only a small window. How do I get back to the previous larger sized window? This is a God-spend. I'm writing a book about an asteroid that strikes the earth is three places and I was struggling trying to picture what the damage would do to real geography. With this tool I can realistically describe what happened and where based on blast radius, crater diameter, tsunami targets, everything, Its fantastic. Hello. I have been using your tool for years now almost once a week, no other solution even comes close. Please consider add a premium option with the features you had to remove due to increased costs. What changes were made beyond your control that are too expensive? This WAS the best distance calculator and I used to use it on a daily basis. Without the option to search addresses or coordinates, it offers nothing new. To bad the chart showing the elevation of your route is not available. I will have to find another site to use. 30 out of 2143 comments shown. See all comments.